We’ve racked our brains and we can’t think of a single popular consumer electronics product that goes on sale less frequently than Apple’s AirPods. In fact, until Amazon discounted them last week, there are only two or three occasions we know of when they got small price cuts at Walmart. 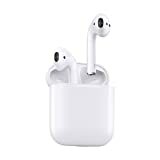 But if you missed out on the action last week, you’ll be happy to learn that the Apple MMEF2AM/A AirPods Wireless Bluetooth Headset is shockingly still available on Amazon at the lowest price ever. There’s no way they’ll stay in stock much longer, so definitely get in on the action while you can.